I love discovering methods to process farm products without using any energy; even more so when one of the requirements to process said products is heat. I have to gush over the success of this quick and easy project as I designed it around the concept of a car heating up when parked in the summer sun. Beeswax melts around 150 °F/65°C so summer sun is all you need! Beeswax sticks to absolutely everything and is nearly impossible to get off once it sets. In the past, running molten beeswax through a strainer resulted in immediately congealing wax that clogged and overflowed on the kitchen counter. Amazingly, with this design the only items that touch molten beeswax is the strainer, filter and pot. As the wax is held at molten temperatures for the duration of the process, the only item that retains any wax is the tiny bit the optional cheesecloth filter absorbs and a very thin film on the inside of the pot. So I’ve pieced this design together over the last few months. For the long and entertaining story of my trials and tribulations, see this post. Note: I always freeze the wax overnight first to ensure no wax moth eggs or other bugs survive. Then I just store it in airtight containers until I build up a large stock to melt in the summer. Below I will quote and link to new products, but I acquired everything except the cheesecloth secondhand for a final investment of $28.80 or $83 when buying everything new from amazon. Below is my exact setup just to make sure everything fit together! Attach cheesecloth beneath strainer if extra filtration is required. Otherwise, omit the cheesecloth. Quickly but safely pour the wax into your molds of choice before it has a chance to cool. I just use paper cups! Peel the paper cups away after the wax cools and simply store the wax in a manner that prevents critter intrusion or weigh it for sale. Note on pictures: I really wanted to include pictures of the whole process. However every single day this week at 12:30 pm, thunderclouds rolled in. Even worse, they never yielded much needed rain! Pictures will be updated on the next sunny day, Monday or tuesday appear promising. The cooler: Craigslist is probably the best option but keep an eye open at yard sales or thrift stores as well. The cooler pictured is one that was not longer in use by my parents, but I also acquired from craigslist years ago for $10 an old 5 gallon igloo drink cooler like the ones you see at sporting events. It was my first mash tun before I upgraded my homebrewing beer setup to 10 gallon batches. 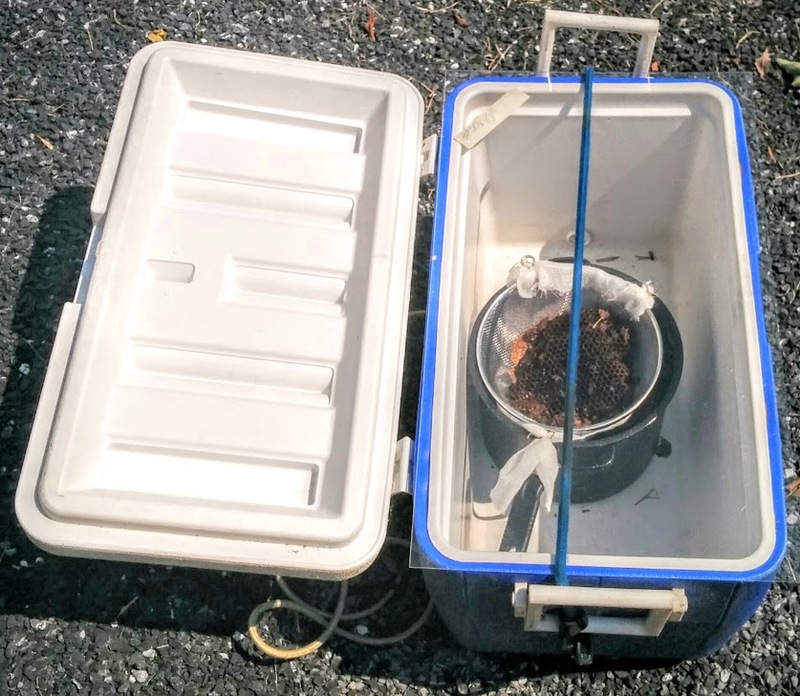 You may be able to do even better by rescuing a cooler with a lost lid, as all the lid does on my cooler is catch wind and flop the whole set up over. Alternatively you could just make a simple wooden box or possibly insulate a standard five gallon bucket. In fact, I may try the next batch in a bucket just to see if it works. Whatever you choose, make sure the pot fits! Pot: I chose a stockpot for this project. The dimensions are efficient to fit within a wide array of coolers, compact handholds instead of long handle(s) is better accommodated within the cooler, and there is no plastic. I acquired mine for $4 at the thrift store. The previous owner had damaged the enamel coating inside the pot which matters not for this project. In fact if a friend or family member has done the same, you may be able to get a free one! Strainer: $1 at a thrift store. I’m considering buying a new one without a plastic handle as they are ~$5 on amazon or simply cutting off either the plastic or the entire handle. The handle could also be cut off to fit in a smaller cooler. Plastic + heat + UV rays = either melting or off gassing of chemicals or deterioration. Glass/Plexiglass: I was originally scouring the barn loft for a discarded storm window. Then I considered checking out the Habitat for Humanity Re-store where contractors cheaply offload unneeded or recycled building materials…basically a thrift store for building materials. I even called an autoglass shop looking for scraps. By chance when I went to the local hardware store for an unrelated purpose, I inquired about getting glass and Plexiglas cut. The quotes were around $5 and $11, respectively. Way cheaper than I was expecting so I chose Plexiglas for durability. It also occurred to me that my dimensions closely match those of cheap poster wall-hanging frames like I had in college. One could be cannibalized from the thrift store! Cheesecloth: Amazon or Walmart or I’ve even seen them in grocery stores however they were add on items hanging in random isles. The plus side is that I found mine hanging in the canned food isle on sale for $2 for a 6 yard cloth. After the first test run with cheesecloth, I might be looking for something more substantial like the bags on amazon for about $5 that are made from better cotton intended for yogurt or nut milk. I’ve had to trim some poor comb from my hives due to an oversight on my part. I accumulated enough to start learning how to process the wax. My first venture in melting wax was a hilarious disaster. I tried rendering the wax via a warm bath in an improvised mason-jar-in-pot-in-a-bigger-pot double boiler. Problem 1: If the water level was too high, the jar would float, tip and take on water or raise the wax level above the hot water and just be ineffective in general. Problem 2: With such a low water level, the wax would cool and solidify against the glass above the water level when I attempted to pour the molten wax through the strainer. Solution to problem 1 and 2: Put a brick on the mason jar. Cumbersome when needing to stir the wax, but it worked. Problem 3: As the wax was poured through the room temperature strainer, the wax quickly solidified clogging the metal mesh resulting sending the flow around and down the sides of the paper cup getting the nearly impossible to clean wax everywhere. Solution to problem 3: Utilize yet up another large pot and stove unit for a hot water bath to keep the strainer hot. However this resulted in water dripping into the finished wax. Problem 4: The wax coated the butter knife I used to stir it then solidified seemingly permanently. Not to mention the pots and jars exhibiting the same cemented wax. I never wanted to touch wax again. One day after returning to my car parked in the sun, the figurative light bulb illuminated in my head. As skin burns when in contact with 140 degrees for 3 seconds, my truck had to be close to that point as I could not even touch the steering wheel without it feeling like my hand were on the verge of blistering. Beeswax melts around 150 °F/65°C so what if I simulated my car? To test the concept, I placed a half pint mason jar containing a small chunk of comb on the black dashboard of my truck. I then angled the vehicle so the windshield faced directly into the sun. To my immense excitement, the wax was pooled when I checked an hour later. For my next attempt, the prototype to my finished melter was created. Since I am sharing my full design tomorrow, I simply set a cooler containing a wax-filled strainer atop a pot in the sun. It did not quite get hot enough, at least not within my attention span. So the wax softened but barely dripped. According to my digital thermometer it was at 130 degrees after a few hours. 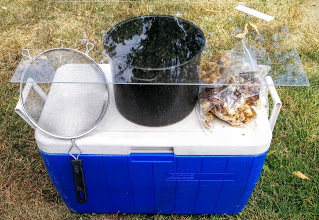 The next iteration of my design was to replace the lid of the cooler with a piece of glass. I wrestled over where to source a discarded storm window after scouring the barn for scrap glass and even called an auto glass place looking for scraps. It was entertainingly hopeless trying to explain the intended purpose of glass. Then one day when I was at the locally owned hardware store for unrelated matters, I inquired about the expense of cutting a custom piece of glass at 14 inches by 24 inches to fit the cooler. For glass it was $5.60 and Plexiglas was $10.80. As the figures were far and away less than I was expecting, I waited 5 minutes for a piece of plexiglass to be cut. I was prepared to either paint or line the interior of the cooler black to match the effect of my dashboard in my experiment. In the end, this was not needed! I’m glad I didn’t go with glass because during the first trial run, the wind caught the erect lid still attached to the cooler and knocked the whole melter over. Luckily this occurred early and the harvested comb was still solid as it spilled into the grass. Wrapping a bungee cord around the cooler to hold the window in place and utilizing a niche in a pile of extra gravel in the barnyard to cradle the melter. With the new additions, the wax was successfully melted in fifteen minutes during the hot August midday intense sun. Even better, the only wax that persisted to dirty the utensils were a thin coating on the pot and a small amount absorbed by the cheesecloth. No dirty pots, no crazy double boiler contraptions, no spills nearly-permanently coating the kitchen surfaces, and no cooking fuel used. Be warned though, anything that went into the melter was very hot so oven mitts are a must! However one last issue remained. While the metal strainer successful withheld bee carcasses and large body parts from the rendered wax, many small impurities passed through. These impurities are not vital for most applications of beeswax, but do pose a problem for candle makers. If I ever produce a surplus and want to sell the wax, impurities become a more important consideration. My final design is the exact same as before with the addition of cheesecloth attached to the strainer. This did the trick and resulted in relatively pure wax. I reclaimed the kitchen utensils from my first attempt that I initially thought were permanently coated in wax. The mason jars, stirring knives, clogged strainers, etc. wrnt into the solar melter and after wiped with a rag while still hot, came out clean and with only the lightest coat of anti-rust and anti-microbial beeswax. Here is the melter in action! The detailed design will be posted tomorrow!